Medvednica Mountain guards Zagreb, like a fairy godmother. Throughout the centuries city folk thrived on its abundance of spring water, firewood and food from nearby villages. Today, the mountain is about leisure, not livelihood. For locals, hiking is a favorite weekend pastime, but also the essence of their identity. The nature park, which covers nearly 70 square miles and is criss-crossed with hiking trails. The central part around Sljeme hilltop (3,395 feet) teems with mountain huts known for excellent home cooked food and great views. Zagreb’s quick and easy access to the Medvednica forests is a luxury few capitals have. But it is also why people rarely spend there longer than half a day. Still, with many nature and manmade landmarks the mountain merits at least an overnight trip. The defining feature of Medvednica is its verdant and exceptionally diverse forests. The thick centenary woodland begins at the foot of the mountain. You’ll be transported completely by the time Sljeme hilltop comes into view. Most trails are lined by the beech trees with smooth glittery bark. But many other species are sprinkled between, such as oak, chestnut, hornbeam, linden and yew. Water is another natural gift on Medvednica. There are springs and streams around every bend. Though hikers are usually advised to bring water, locals love to fill their bottles at the springs. One of the nicest water displays on the mountain is Sopot Waterfall where Vrapcak brook spumes and cascades from a 20-foot rock. This western side of Medvednica also hides one of Croatia’s most unique paleontological sites: Veternica cave. Today, the cave is known as home to 18 species of bats which hibernate inside its canals. But during a visit, a licensed guide shares more stories of its intriguing past. Bones and fossils found on site are proof that a cave bear, a cave leopard and other beast once lived here. Some 1,200 feet of Veternica’s length is lit with atmospheric yellow lamps. But for city people, the top experience is witnessing complete darkness. This happens when the guide turns the lights off to demonstrate how bats use echolocation to move around. Medvednica boasts a number of remarkable historic sights. 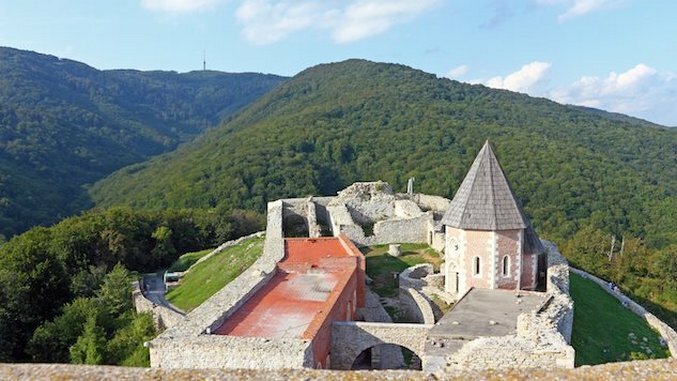 Its signature landmark is the 13th century Medvedgrad Castle, built in a strategic position to protect Zagreb from the Tatars invasion. The castle’s turbulent past has inspired many ghoulish legends, including one about countess Barbara of Celje nicknamed the Black Queen, who is remembered for her diabolic torture methods. Today, Medvedgrad Castle attracts visitors with its sweeping views of Zagreb. The unique setting of the fort is often used for various music and cinema events as well as for Medieval Days festival which takes place every year in late September. Another spot, the 16th century silver mine, was once owned by the noble family, Zrinski. This unique underground museum opened for visitors in 2004. Only a few navigable levels are fully reconstructed but that is more than enough to conjure up how harsh a miner’s life was just a few centuries ago. On the eastern side of Medvednica Horvat’s steps possibly beat all other manmade sights. The stone staircase is work of Vladimir Horvat, who took seven years to build 500 steps over wild inaccessible karst. More than 50 years later, it is hard to tell what is more striking, this man’s achievement or how the steps had merged with nature. Horvat’s steps lie close to the protected forest of linden and yew trees and enable hikers to peep inside karst formations that are otherwise difficult to reach. The diversity of outdoor activities is what makes Medvednica stand out. Even a casual walker can enjoy roaming along the relatively flat trail 26 that runs along the mountain ridge. Those ready for more strenuous efforts usually go on a two-hour hike to Sljeme hilltop. Two of the most trodden routes are trail 18 from ‘The Tunnel’ or trail 12 from village Šestine via Medvedgrad Castle. Trekking, trail-running and cycling have become increasingly popular too. The nature park now has cycling-only routes, eight of them circular and one transversal. Calories burnt during outdoor activities can be replenished in bountiful mountain huts. Their superb home-cooked food served in the rustic ambiance makes for a well-deserved treat. Simple menus feature hearty dishes, such as beans and sausage, roast turkey with traditional mlinci pasta, rounded with the dessert of cheese or apple strudel. But hikers aren’t the only travelers who will find interesting ways to spend time here. Medvednica attracts more and more people with specialized interests. The 100-foot limestone rock Gorsko Zrcalo, for example, is a favorite for Alpinists and free climbers. Also, from recently, bird-watchers are treated to special falconry tours with trained birds of prey. Most visitors to Medvednica access the mountain from Zagreb. But trails run on the northern slopes too, connecting it with Zagorje region. One of them is a popular Marian pilgrimage route to the town of Marija Bistrica. The other leads to the historic Stubica town, site of the 1573 Peasant Uprising, which also features the famous spa and wellness center Stubicke Toplice. -Sljeme hilltop can also be reached by bus, operating hourly from Mihaljevac. -Tomislav Hotel has swimming pool, fitness and sauna on site. Double room with breakfast starts from $73. -Detailed info on Medvednica can be found on the Medvednica Nature Park official website. -More info on suggested trails can be found on Trail Running Croatia.